Admission: Date at which an individual was reported to have been admitted to the institution for which a Medicaid claim has been paid. Admission may occur before the beginning of a Medicaid-financed institutional spell if a person entered the facility with a separate source of payment -- for example, Medicare or private insurance -- before Medicaid began covering services. Age: Age is defined as the enrollee's age at the beginning of his or her first new Medicaid-covered institutional spell between July 1, 2006, and December 31, 2007. Aged (BOE Group): A BOE group that includes enrollees age 65 or older who qualified for Medicaid due to their age.Because some states code all people over 65 as aged, enrollees who were older than 65 but were categorized in another BOE group in MAX were recorded as aged for this study. Basis of Eligibility (BOE): Eligibility grouping that traditionally has been used by CMS to classify enrollees as children, adults, aged, or disabled. Cash Assistance-Related (MAS Group): A MAS group that includes persons receiving SSI benefits or mandatory state supplements and those who would have qualified under the pre-welfare reform Aid to Families with Dependent Children rule. Among aged and disabled enrollees, the cash assistance-related MAS group consists of people satisfying the first, SSI-related requirement. Disabled (BOE Group): A BOE group that includes persons of any age (including children) who are unable to engage in substantial gainful activity by reason of any medically determinable physical or mental impairment that can be expected to result in death or that has lasted or can be expected to last for a continuous period of at least 12 months. Because disabled people over 65 are often but not always categorized as aged, all disabled people over 65 were recoded as aged in this study. Dual-Eligibles: Persons dually enrolled in Medicare and Medicaid. In MAX, dual-eligibles are identified as people in the Medicaid Statistical Information System (MSIS) with matching records in the Medicare Enrollment Database, indicating enrollment in both Medicare and Medicaid in at least one month during the study period. Fee-For-Service (FFS): A payment mechanism in which payment is made for each utilized service and does not include services provided under capitated arrangements. Home and Community-Based Services (HCBS): Services covered under Section 1915(c) waivers and personal care, residential care, home health care, adult day care, and private duty nursing services that are mandatory or are provided at state option. Because unduplicated measures of HCBS waiver use and service-specific use are not available in the MAX PS files, this analysis identified HCBS recipients as those who were either enrolled in an HCBS waiver or used one or more of the following state plan community-based services: personal care, residential care, home health care, adult day care, and private duty nursing. 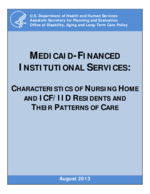 Intermediate Care Facility for Individuals with Intellectual Disabilities (ICF/IID): Medicaid-financed facilities for the care of ID/DD. These institutions are an optional Medicaid benefit that states may choose to offer; they are required to have four or more beds and offer treatment or rehabilitative services to people with ID/DD. Maintenance Assistance Status (MAS): Eligibility grouping traditionally used by CMS to classify enrollees by the financial-related criteria by which they are eligible for Medicaid. MAS groups include cash assistance-related, medically needy, poverty-related, 1115 demonstration waiver, and other. Managed Care: Payment mechanism used to manage health care, including services provided by health maintenance organizations or PACE, prepaid health plans, and primary care case management plans. Services provided under managed care plans are not included in the measures summarized in this report. Medically Needy (MAS Group): An MAS group that includes persons qualifying for Medicaid through the medically needy provision (a state option) that enables states to cover persons with higher incomes who may have significant medical expenses. Persons with income above the medically needy threshold can deduct incurred medical expenses from their income and/or assets -- or "spend down" their income/assets -- to determine financial eligibility. Other (MAS Group): An MAS group that comprises a mixture of mandatory and optional coverage groups not reported under the other MAS categories, including many institutionalized aged and disabled people qualifying under the "300 percent rule," which allows individuals with income up to 300 percent of the SSI threshold to qualify for Medicaid assistance for institutional care; those qualifying through HCBS waivers; individuals ineligible for SSI due only to their Social Security Disability Insurance benefits; and those covered under more restrictive requirements than SSI standards in Section 209(b) states. This MAS group also includes many other groups, such as children receiving Title IV-E foster care payments or adoption assistance and caretaker relatives. Poverty-Related (MAS Group): An MAS group that consists of persons qualifying through any poverty-related Medicaid expansions enacted from 1988 on. For example, states can elect to extend full Medicaid benefits to otherwise ineligible aged and disabled people up to 100 percent of the federal poverty level. In addition, this group includes people qualifying only as Qualified Medicare Beneficiaries, Specified Low-Income Medicare Beneficiaries, or Qualified Individuals. Program of All-Inclusive Care for the Elderly (PACE): A managed care plan that coordinates both acute care and LTC for eligible enrollees (those who are 55 and older, living in a PACE area, and otherwise eligible for nursing home care). A capitated payment mechanism is used for PACE plan enrollees. As a result, service-specific information is not available for services provided under PACE or other managed plans. Restricted-Benefit Enrollees: Enrollees who receive limited Medicaid coverage, including unqualified aliens only eligible for emergency hospital benefits, Qualified Medicare Beneficiaries, and people eligible for only family planning services. Some enrollees may be eligible for a restricted set of services but are coded as full-benefit enrollees -- for example, those eligible for only prescription drug coverage and Medicare cost-sharing. Section 1115 Demonstration Waiver (MAS Group): An MAS group that consists of people eligible for Medicaid via a state 1115 waiver program. The Secretary of Health and Human Services may authorize 1115 demonstrations to permit states to test innovative approaches to providing health services to low-income residents, including extending benefits to certain otherwise ineligible persons. Some states provide only pharmacy benefits or other limited services to 1115 enrollees, although a few states provide full Medicaid benefits to persons qualifying through 1115 provisions. Many 1115 waivers also have other provisions such as mandatory managed care coverage but the 1115 eligibility category only relates to eligibility extensions. Aged or disabled persons in the 1115 group typically qualify under poverty-related expansions. Section 209(b) State: A state that elected to use more restrictive eligibility requirements than those of the SSI program, but these requirements cannot be more restrictive than those in place in the state's Medicaid plan as of January 1, 1972. Section 209(b) states include Connecticut, Hawaii, Illinois, Indiana, Minnesota, Missouri, New Hampshire, North Dakota, Ohio, Oklahoma, and Virginia. Spell: A period during which a person received Medicaid-covered nursing home or ICF/IID services. Because MAX data were available only through December 31, 2007, at the time of this study, all spells are censored on that date.